By Jenny Murphy Byrne | November 25, 2017. The Liberties is constantly evolving. From idyllic green spaces to luxurious student abodes, the battle to harmonise the traditional with the contemporary is ongoing. But it is the people of the Liberties that illuminate the streets of this ever-changing part of the city. From the 1950s to the 1990s, the community has been through many phases, and one man’s photography details a fascinating social history and celebrates of its people. “My grandfather, John, was a wonderful, kind man. He always had time to teach us new things, he loved adventure and loved heading off on an adventure,” says Suzanne Behan. John Walsh ran his photography business out of a small shop on 50 Francis Street. He captured every aspect of the inner city – funerals, communions, weddings, christenings, even concerts. “He really loved capturing people and recording memories, it was important to him to capture that special moment in a decade when a lot of people could not afford to own a camera, he was also fascinated with technology and was a little ahead of his time,” adds Suzanne. 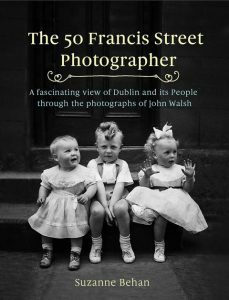 In the newly released book, The 50 Francis Street Photographer, John’s unreleased images from the 50s and 60s are brought together with the words of his granddaughter, Suzanne Behan, providing us with a nostalgically charming peek into the Liberties’ past. For Suzanne, however, compiling her grandfather’s work meant far more to her than a mere passion project. “I began this project when I was recovering from cancer, it gave me a chance to take my mind off my cancer and it was a lifeline for me,” says Suzanne. Though she now lives in Kildare, hearing Suzanne speak so fondly about the Liberties, it is clear John’s love for the place has spilled over. And it appears the book is not only a tribute to her grandfather, but to the people within the collection also. “The Liberties is a fascinating place with so much history and a community that truly appreciates the hardships of the generation that has passed, times were tough in the 50’s and 60’s, but yet, everyone is smiling in my grandad’s photos, people shared what they had and the sense of community in the Liberties is so evident,” she says. 40 years ago, photography wasn’t as glamorous or forgiving as it is now. There were no filters or post-production touch-ups. Instead, John spent hours manually developing his photos in a dark room. Since launching, the Facebook page “The 50 Francis Street Photographer” has over 5000 photos of people, schools, events, pubs, and families. People from across the world have been messaging Suzanne to say how much they related to the images and the overwhelming pang of nostalgia they felt when scrolling through the page. Once the page was established, the opportunity arose for Suzanne to publish a book chronicling her grandfather’s adventures and the people he photographed. Following the book’s release last year, Suzanne has been met with a slew of messages and support from the Liberties and beyond, praising her and her grandfather’s contribution to the photography world. Today, Suzanne spends her time behind a viewfinder, just as her grandfather did on the streets of the inner city. And while she claims she’s just an amateur, securing last year’s Midlands Photographer of the Year, could foreshadow her own possible collection of photos in the future. With an archive spanning from 1948 to 1998, Suzanne believes there is around 50,000 still to be released – only 7,000 photos were scanned for the book – and would love to immerse herself in another project, but she can’t do it alone. “I certainly didn’t get to cover everything. It would be lovely to do another project with the photos as the social history that has emerged from them is immense. I would love to get the support of Dublin City Council or the perhaps the Liberties Festival to make these photos accessible to the people through an exhibition,” says Suzanne.